Reading the Bible has been called a ‘means of grace.’ For the Christian, it is both a privilege and duty. When people focus on the duty but misapprehend the privilege, discouragement is swift to follow. The idea Christians must read the Bible is common knowledge within the Christian community. However, it is the experience of this author that many Christians have trouble articulating why they should. To the satisfaction of others? If you can, how well does your answer sustain your efforts? 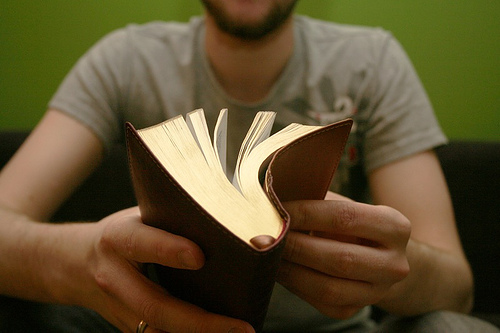 Do you struggle to take time regularly to read your Bible? If you struggle, you are in good company as many faithful Christians do. This author does. So, right up front we have two fundamental “why” questions we need to answer before we get into the hows and wherefores: one theoretical to explain the habit, the other existential, as relates to motivation. Why is this incorrect? Does the Bible say to do it? Even a quick reading of these three passages reveals God’s concern for our comprehension and exposure to his Word. The Deuteronomy passage uses references to putting scripture up all over the place, particularly the body. The purpose is to show how much God wants the scripture to penetrate our hearts and minds. The 2 Timothy passage tells us all Scripture is valuable because it is God breathed. That means all of scripture issues forth from God, it is his, and is therefore true and holy. Paul lists a slew of great uses for scripture, but it is all God breathed. More on that in a moment. 1 Peter is less direct, but the context is the believer under duress, being asked to give a reason for his/her faith, and the hope that is in them. Can you explain the gospel to the soldier holding a loaded gun to your head? What about at your execution for conversion to Christianity? Peter is commending his Christian audience to be ready within such a context. Their daily reality was life or death persecution. While that was roughly 2000 years ago, Peter’s call to be ready has lost none of its weight, even for those of us free from such severe persecution. So it is valuable. Still, what is my motivation? If you answer that question with the imperative of “because I am supposed to,” you have missed the point. An imperative is a command. The command to read, study and know scripture is either directly or indirectly present in all three passages given above. However, the command is not the justification for obedience, it is what obedience looks like. It is meant as guidance only. Relying on the command to motivate you will only wear you out because motivation comes from somewhere else. Where is the motivation to read the Bible? In the military, a soldier trains to be ready, and a good soldier takes training seriously. The question is not whether you are going to use the training soon but that you are a soldier, and by definition, you are to be ever ready. That is your identity: soldier. This is doing because of identity and action that flows out of identity is at the heart of these three verses. All three passages are written to God’s people. The original audiences were varied, being separated by time and space. Their IDENTITY as God’s people was the common thread uniting them all. They were his children, and by implication, He was and is their Father. So the command to know scripture, to let it penetrate your heart through constant exposure and deliberate study is a constant theme throughout the whole of scripture. You are supposed to know your faith so well, the cold press of a gun barrel fails to silence its message—that imperative command is built upon the foundation of Identity in and with God. Reading the Bible for duty’s sake misses the point of all three passages. It is a reason, but lacks sustaining power. When times are hard, duty will be a burden you long to put down. It may even break your back. You need more than an “I told you to” when the going is rough. Our call to be students of the Word is built on the Christian’s identity as an adopted son or daughter of God. Family tradition demand we know scripture like Jesus did. If you are a Christian, an authentic life requires regular reading and study of the scriptures as much as being human requires sleep, oxygen and vitamins. Authenticity demands you be true to your identity and reading the bible is authentic to the Christian identity. Christians should read the Bible because knowing His Word is required to know ourselves and our heritage. This is where it all connects with the scriptures being God breathed (2 Timothy 3:14-17). God is our Father and we should be about the family business. To do this we must know who he says he is and what he says about us. The Bible is your best repository of such things. If this is true, how should we go about reading the Bible? Is there a proper way or will any way do as well as another? How do you maximize your Bible reading? These questions and more will occupy the next installment of this series. NOTE: This is the first post of a series on reading the Bible. Thank you for sharing why it is important to read the Bible. Like you said, for a Christian, it is both a privilege and duty. Many people are searching for more spirituality in their lives and reading the Bible is a great way to do this. I have many friends who started to read the Bible and were able to make God a big part of their lives. Thanks again.